As the New Year approaches (but not for China), both President Rodrigo Duterte and President Xi Jinping prepare to settle their differences. The new condition for peace between China and the Philippines renewed the demand that both Nobita Aquino and Joseph Pabaya should be run over by a train. Since Nobita and Pabaya are no longer in office it looks like that this time, Filipinos will get the chance to see both of them ran over by a train for sure. 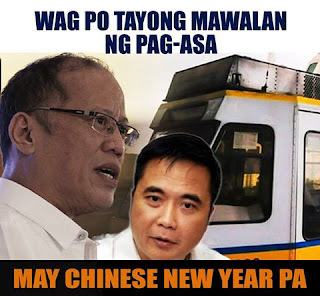 "As part of the peace treaty between China and the Philippines, the Chinese government now renews its demand to have both Nobita Aquino and Joseph Pabaya run over by a train this Chinese New Year. Tomorrow is the Solar New Year. That should provide the Philippines enough time to honor their part of the agreement. The Chinese calendar's first day of the Lunar Month hits on January 28, 2016 according to the Gregorian Calendar. January 27 is Chinese New Year's Eve and I'd gladly sit down with the Philippine government to see both nincompoops run over. After all, isn't it also their fault that a lot of Chinese crooks flee to the Philippines for protection?" said President Xi. "This is an outrage. China is once again bullying the Philippines and President Duterte isn't doing a thing about it. Instead, he shook hands. Many Filipinos are ungrateful that Nobita turned their country into a first world country." said Loida Nicholas-Lewis. Lewis herself still lives in the United States and has been demanding that President Duterte should resign. She also revealed that she wants Liar Dilemma to be the new vice president. Lewis called Filipinos living in America to protest against the running over agreement. However, more Filipinos who are now frustrated with the MRT not only demand for Nobita's and Pabaya's lives but also for everyone responsible for the MRT fiasco. Part of the new Philippine-China peace agreement will also demand for at least eighteen crooked Chinese businessmen hiding in the Philippines to be handed over together with Stinky Soliman and Mar Roxas. DSWD Secretary Judith Taguiwalo confirmed that Soliman and Roxas had bought rice preserved in formalin for the Yolanda Victims. The chase is on to find out where the illegal Chinese who sold formalin rice to Soliman and Roxas are. "We will gladly hand over the two of them to China. It would be nice to see both Soliman and Roxas get executed like Zheng Xiaoyu the very person responsible for the melamine outbreak. That would be justice for all the Typhoon Yolanda victims." said Taguiwalo. Justice Secretary Vitaliano Aguirre Jr. was shown to have covered his ears together with a group when Liar Dilemma started speaking nonsense. "I covered my ears on purpose because Liar Dilemma is blabbing nonsense. This time, I'm not sorry for it if I ever hurt her feelings. I don't care how brilliant she is but if you use your brain to protect crime then you're nothing. So many illegal Chinese come here not because China sent them but because our government protected them for so long. If Noynoy should get run over by the train then it's justice for the SAF-44. 44 lives were lost during that tragedy. On the other hand, I'll fight for Alan Impurisima's transfer to Mandaluyong together with Antonio Trillanes IV. We will also try to hand more than 18 crooked Chinese businessmen as to save the reputation of the Filipino-Chinese." said Justice Secretary Aguirre during an interview. "Don't worry! I will keep my promise that Noynoy Aquino will be buried at the Libingan Ng Mga Bayani but you Noytards will just have to settle that his ran over corpse will be buried right next to Ferdinand E. Marcos Sr. You can have the parade if you want but just secure your permits and clean up your mess after the burial." said President Duterte.